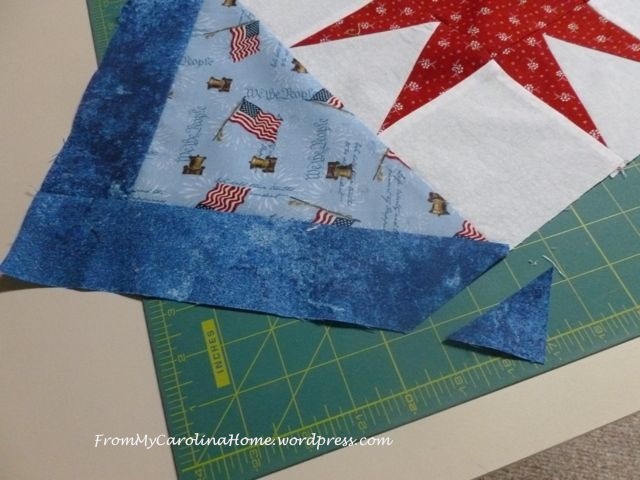 Now that you have your Tri Recs stars and print fabric pieces sewn together, I’ll show you how to finish it up with the borders. Click on Tri Recs Star Block to see part one if you missed it. 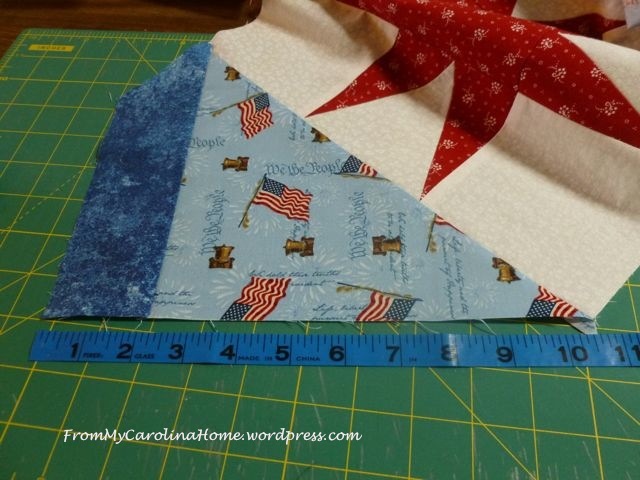 So, we left off last time with three Tri Recs Stars and two printed fabric blocks, plus a triangle on each end. Next, put on the borders. Remember, measuring is important for borders. I started by measuring the short pointed side first. 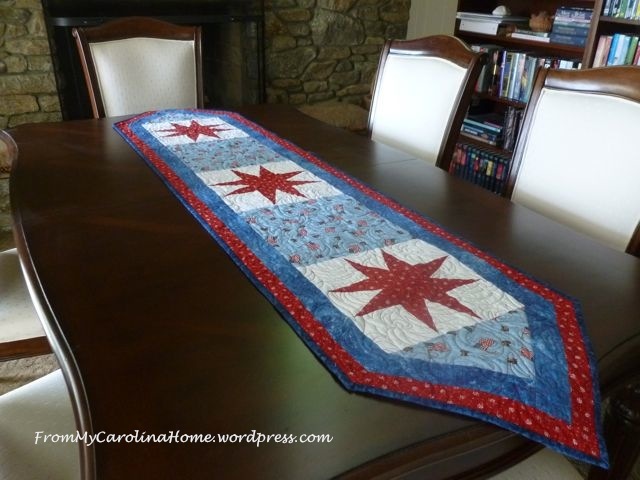 Then I cut and sewed the first border piece. Then I measured the other side of the point to the edge of the outer border. 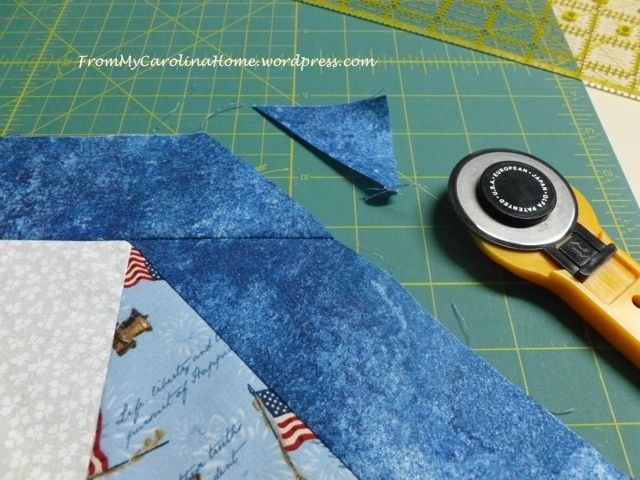 Sew it on, then cut off the point even with the side edge on both sides. Repeat for the other end point. 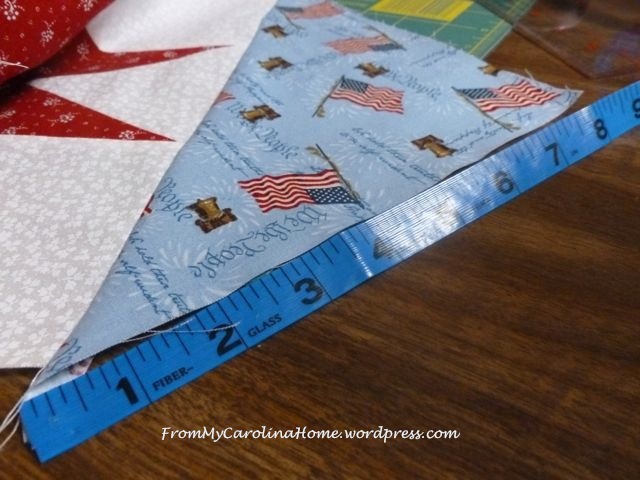 Then measure and cut your side borders. 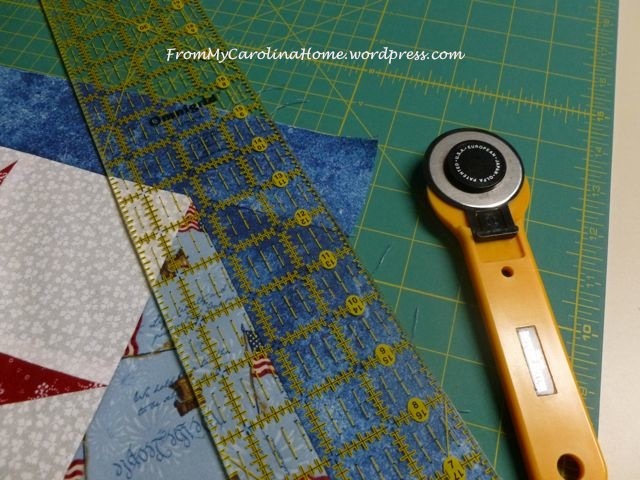 Sew, then trim the point. 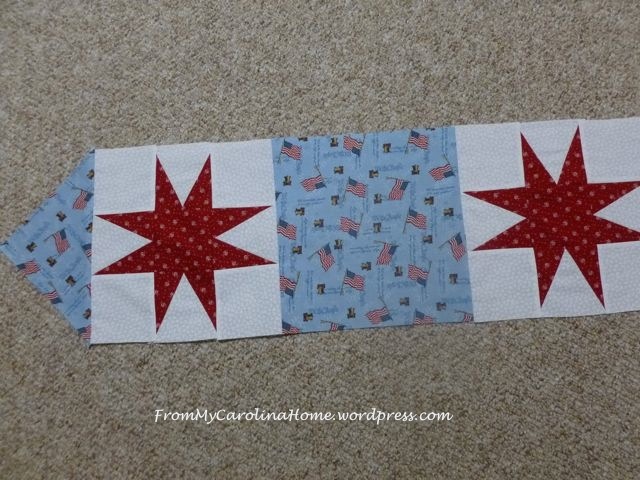 Repeat the process for the outer red border. You can start with the long sides if you prefer. 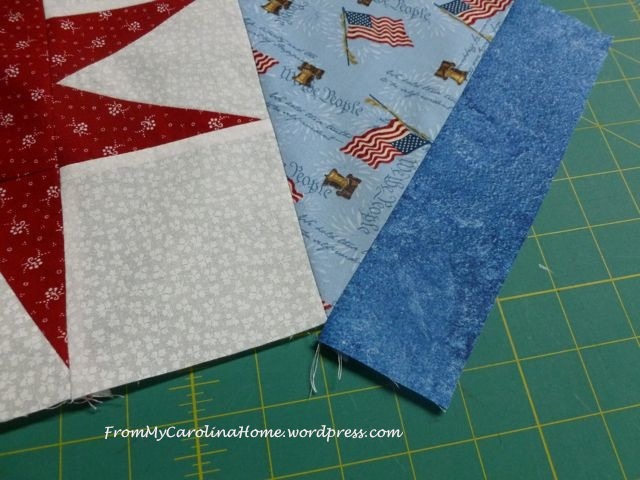 I started with the end points on the blue border, and then did the sides first on the red border so the seams fall in different ways. Quilt as desired. 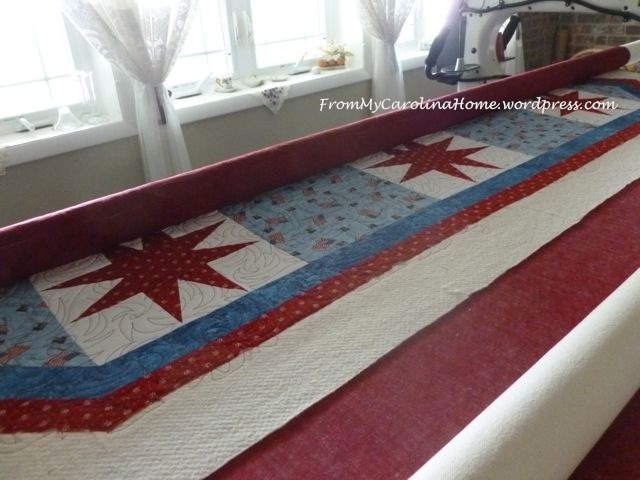 I used my longarm and put a pantograph on it that kind of looks like fireworks called Fern Spin II by Linda’s Electric Quilters. 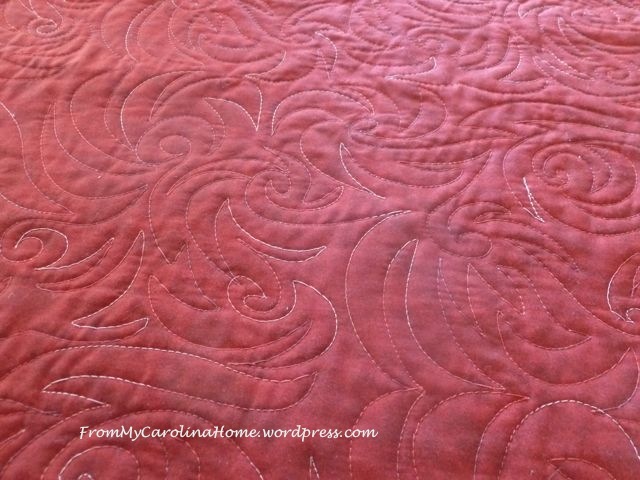 I used variegated red thread. Bind in the usual way. 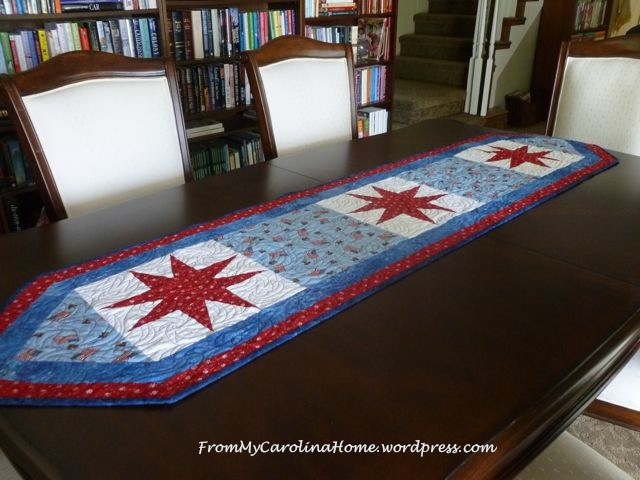 Enjoy your Patriotic Table Runner all summer long! OMG, my post was found by Mark Lipinski!! See it on his wonderful blog at Mark Lipinski’s Blog! Your runner is gorgeous. Stars are my favourites! I am a novice, so I need all the help I can get. 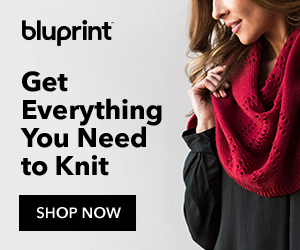 Could you please give me an idea of how much fabric you used please. I think this is so beautiful. I am try to get a collection going. Made a Circle one with Christmas fabric, still need to bind it though, My Thanksgiving one turned out much better. Hi Barbara, I fixed the link at the beginning to take you to the block construction.